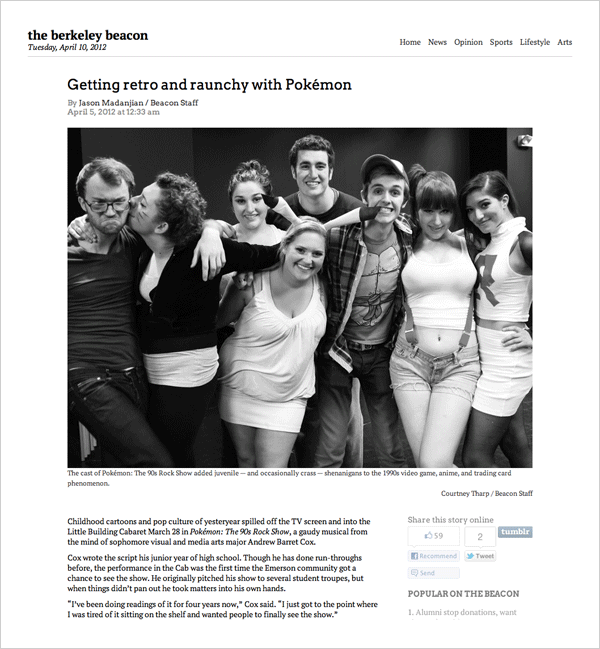 Most college newspaper sites aren’t much to look at; the Berkeley Beacon is an exception. Phelps, Andrew. "Emerson College student paper completes a fully responsive, mobile-friendly redesign." Nieman Journalism Lab. Nieman Foundation for Journalism at Harvard, 10 Apr. 2012. Web. 23 Apr. 2019. Phelps, Andrew. "Emerson College student paper completes a fully responsive, mobile-friendly redesign." Nieman Journalism Lab. Last modified April 10, 2012. Accessed April 23, 2019. https://www.niemanlab.org/2012/04/emerson-college-student-paper-completes-a-fully-responsive-mobile-friendly-redesign/.